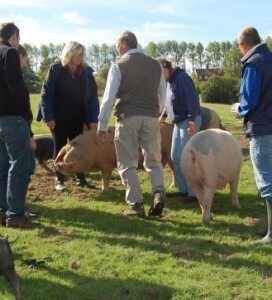 Our one day pig keeping courses are an excellent introduction into the world of pig keeping. Check out our For Sale page for new litters and other stock available. 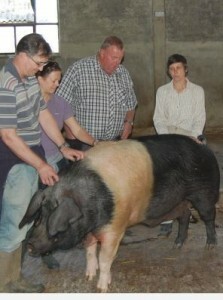 Clare & Robin Wilson have a wealth of pig keeping experience. Take a look at what goes on around Oaklands Pigs. 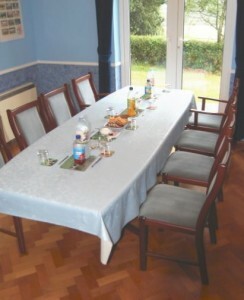 Oaklands Farm is a working farm on the Kent/East Sussex Border, near Tunbridge Wells. We started keeping pigs over 20 years ago, mostly raising weaners for the freezer before starting breeding from our own stock. 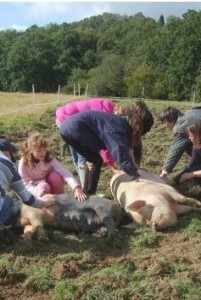 We run Pig Keeping courses from March to September. In early 2005 we replaced our many assorted pigs with new pedigree saddleback breeding stock, the foundation of our saddleback herd today. We have had 8 different bloodlines of Saddleback sows, some of which are now quite rare and 4 boar lines. 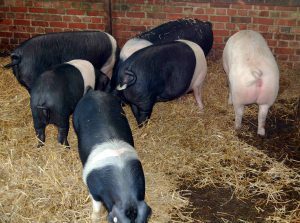 Apart from these, we have examples of some of the other traditional pigs, including Old Spots, Large Blacks, Tamworths, Landrace, and Kune Kune. We have also kept Middle Whites, Welsh, Oxford Sandys, Berkshires, Large Whites and Mangalitzas in the past. We have around 20-30 adult breeding stock at any one time. So between us we have many years of experience of buying, keeping and breeding pigs, and offer friendly advice to those new to pig keeping, or those thinking of moving on to breeding pigs. Here at the farm we have set up a number of different environments in paddocks, woods, and barns with an assortment of styles of fencing and numerous varieties of arks, so that the newcomer can see all the possibilities and decide which would be best for their own set-up. Being a small farm, we can take the time to discuss and help you choose your pigs, and give help and advice on setting up and all aspects of pig keeping. For disease control purposes, we do not hire any boars from this farm, or accept sows for mating. We are not able to offer any vet student or work experience placements, as there is very little maintenance required for our outdoor herd. The weather was kind to us at the Surrey show. Although heavy showers were forecast, we had an overcast morning – ideal for pig showing and a bright and sunny afternoon. 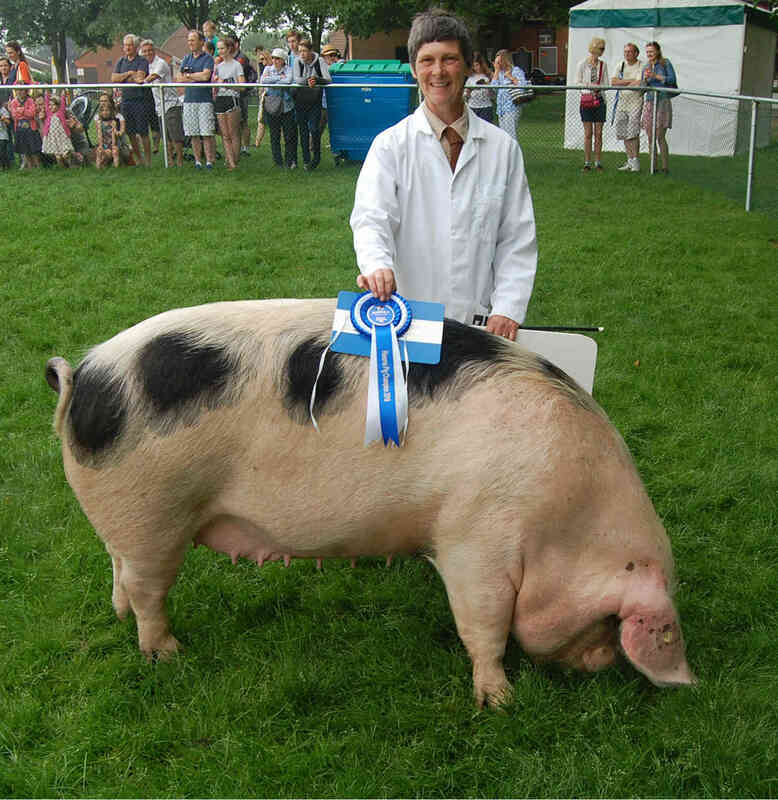 Every pig we took to the show (old spots, saddlebacks and landrace) made the top 3 in their class and took home a first, second or third rosette. And to top it all, Greta the Old Spot won the Sow class and went on to take Reserve Champion in the final. With the agricultural show entry forms dropping on the mat everyday, it is time to decide which pigs will be going to the shows this year. We usually keep back 3 or 4 in each age category and grow them on before we decide which ones will be kept. Here is a group of our July and September born saddlebacks along with an interloping Landrace gilt. It is very hard to breed the perfect pig and the one with the best teats doesn’t have the best markings and the best shaped one doesn’t have the best legs, so you just have to choose the one with the most positive features, that you think the judge might like in the show ring on the day. 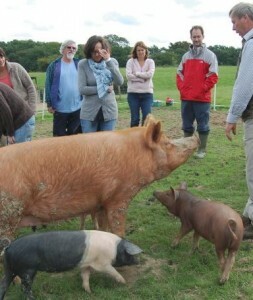 Pigs are shown in age categories with separate classes for boys and girls. There is a class for Adult Sow – which can be any age from 1 year although most sows at about 5-6 years old are getting stiff on their legs so do not move so well around the ring. The next class is for pigs born after 1st July. So during the 2018 show season we will be showing pigs that were born after 1st July 2017. Pigs in this class can be born from July to the end of December that year, although obviously those born later in the year will not be as big and impressive as one born earlier and are therefore less likely to be in the awards. Some shows (but not all) will also have a born after 1st September class. So again we have chosen some pigs that were born close the beginning of September 2017 for this class. The final class and the one that usually causes chaos in the ring is those pigs born after 1st January, so these are shown in the year that they are born. With shows starting in April and May these girls will only be 4 to 5 months old when they go to their first show, so haven’t had much time for training and generally take off round the ring with the handler in hot pursuit. The boys generally only have two classes, one for those born after 1st July and one for those born after 1st January. That means that only young boars are shown and these will still need two handlers in the ring to ensure that they are kept separate from each other avoiding a fight. Trixie the Tamworth says hello !